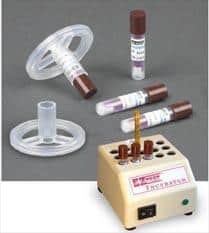 Additional technical and usage information about the EZTest® biological indicator and related testing products is available upon request. The great advantage of a self contained biological indicator over the traditional spore strip in glassine is the time saved when confirming spore kill. Results are easily obtained in only 24 hours (versus the 5 to 7 days required with a spore strip).